This weekend changed my life. 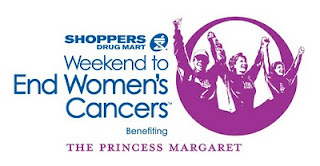 I walked 60km in the Weekend to End Women's Cancers walk in Toronto. My feet are full of blisters but that did not stop me from signing up again for next year! There is a lot that the organizers have done to reduce the events impact on the environment. I only ever received 2 packages in the mail. One was my participant confirmation letter and the other was my ID badge. All other communications occurred via email. A lot of the 'decorations', tents etc are reused year after year. Even the mile marker signs were reused multiple times. What do I hope is different? I hope that they consider recycling and composting at the rest stops. I hope that there will be less useless giveaways (like rolls of toilet paper). I hope that they will consider using computers to allow people to sign up for the walk the following year instead of having papers pre-printed for every participant. I think that any vehicle being used by those working for the walk should be hybrids. I can't wait for the walk next year. Now lets just hope that I can do it without blisters the size of a small country. glad to hear it was a super event! Hi there! I am a new follower, I found you on the green blog hop! Great blog!